I will miss Phuket, there is so much to see and do! Six weeks goes by fast, which is the amount of time I had to spend in Phuket. I wasn’t looking forward to leaving, but I still had some time left to see some great places, and hang out with amazing friends I made this trip, and friends I had come back to see from times before. With one of my days left I decided to go check out Kathu waterfalls. 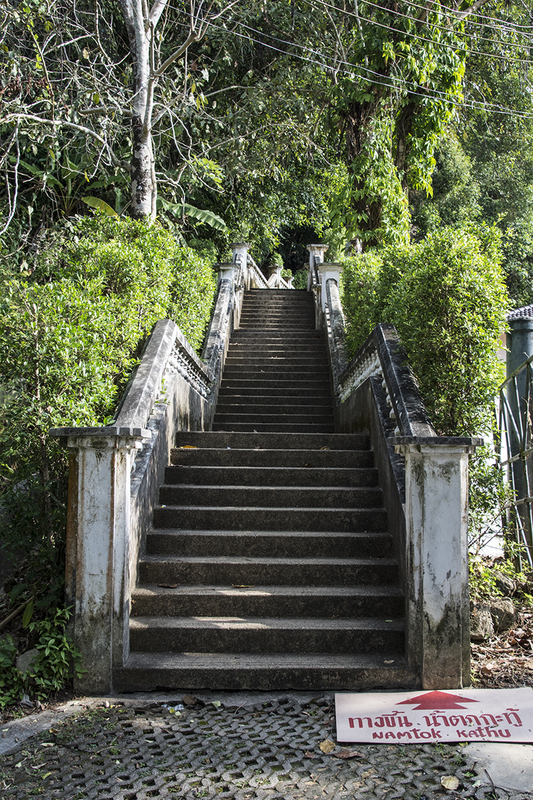 One of several sets of stairs to the top of Kathu waterfalls. The falls aren’t unbelievably spectacular, but they’re definitely worth visiting. The area around the falls is a beautiful rainforest with some amazing twisting vines the thickness of your wrist, from the ground up to what looked like the sky! 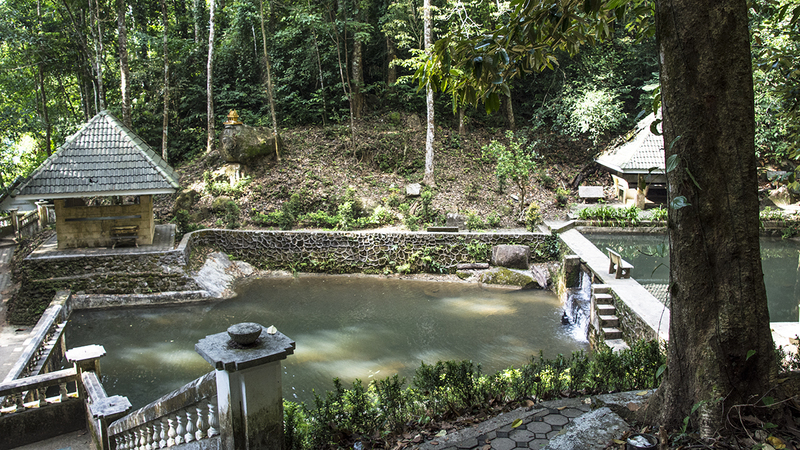 It’s also a tranquil and serene place, as long as the travel buses haven’t gotten there yet. I went early morning and got there about two hours before several groups of people arrived. I would imagine there are other quiet times to see this place too, not only early in the morning. The hike to the waterfalls is also an excellent workout that will test your cardio! The falls aren’t too hard to find, just go through the main part of Kathu and you will see signs pointing you in the right direction. It’s a very nice drive from Phuket Town to Kathu, if you are on motorbike. The closer you get to the falls, the more beautiful it gets. There are a couple of private golf courses in the area that I tried to drive up and take a look at, but that wasn’t happening! The guards took one look at me and my unshaven face, wearing tattered cut-off sweatpants and a sweaty t-shirt and turned me around, haha. Oh well, maybe next time I will wear some knee length khaki shorts and a collared polo shirt and pretend I am a high roller! This is near the top of Kathu Falls where you can enjoy a nice respite from daily life. It would make a great place to meditate! There are a couple of places to buy food and drinks once you get to the waterfalls, and their prices are pretty reasonable. They don’t open too early, though, if I remember correctly. I believe they open around 9 or 10:00 am, so bring some water with you to drink when you climb up and down all the stairs, if you go in the morning!!! 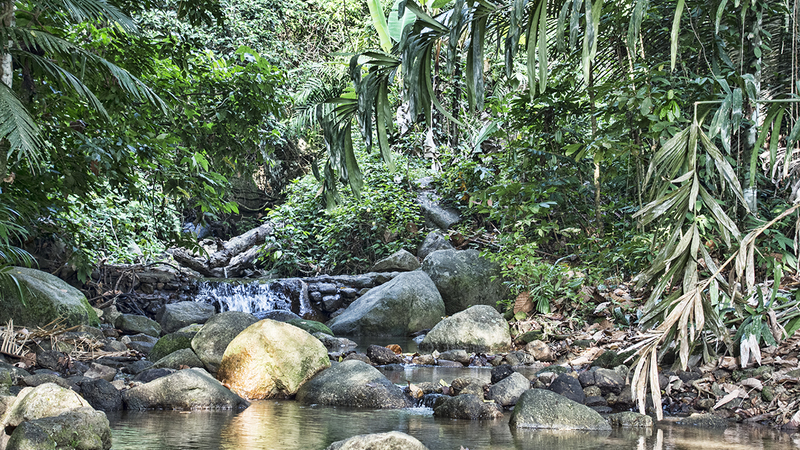 If you decide to go past the last waterfall at the top and wander into the jungle, I would highly suggest bringing a partner. Khao Rang Hill Viewpoint, is a great place to get up early and watch the sunrise or stay late, watch the sunset and then eat a delicious meal! Another great place to go to in Phuket is Khao Rang Hill Viewpoint. It is beautiful anytime of the day, but the best times to go are in the morning when it is so peaceful and quiet, or just before sunset when the sun turns the sky into amazing colors if the clouds are right. 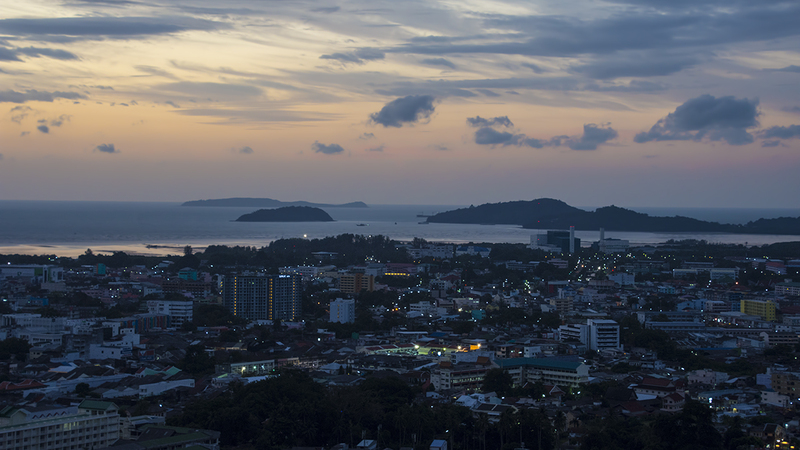 There are also a couple of restaurants at the top, along with the excellent viewpoint that looks out over the entire southern part of the island and Phuket Town. I have only eaten in one of the restaurants, Tunk Ka Restaurant & Cafe. You can get a stunning view from this place while you eat a very good plate of food at a reasonable price, considering the view! I ate here a couple of times, and really enjoyed it. This viewpoint is stunning, so don’t miss this place if you venture to Phuket! 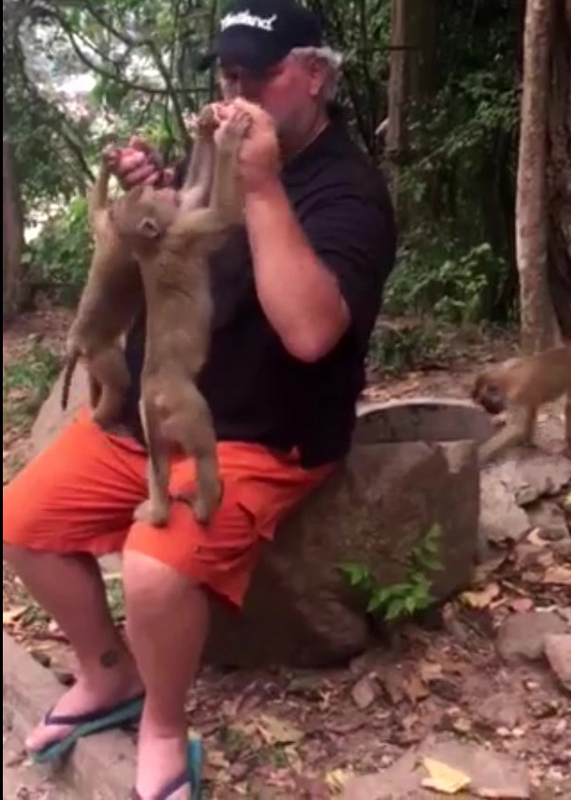 Me feeding two monkeys at Monkey Hill in Phuket. If you are into seeing monkeys, then Monkey Hill is your place! You can find this hill just to the east of Rang Hill, but it doesn’t have as good of a view. Even so, it’s still a pretty decent spot to see most of Phuket Town. And, it’s fittingly named too, as there are hundreds, if not thousands of monkeys running all over the hillside! Don’t forget to bring bananas though, or they will be VERY mad at you! If you forget to grab some on your way there, you can almost always buy bananas for pretty cheap at the entrance before you wind your way up the hill to see the monkeys. It won’t take you very long to find a monkey though, they are everywhere, and if you have a banana in your hand, they will find you! click on my link to see a short clip of me feeding two of them bananas. Do be careful though, some of them are not always friendly, and they will run off with your purse or camera bag, etc. I had a great time up here, and would definitely go up to see them again. If I remember correctly, both Monkey and Rang Hill have areas to work out at, too. One of the things I love about Thailand is they are all about fitness. You can find stationary machines that use your body weight all over the country to keep yourself in shape. This is a nation that seems to value their health, and makes sure everyone has a place to stay fit by providing the people with free equipment to work out on! So not only can you feed they monkeys, you can swing on some monkey bars when you are done too! Phuket night market, in old town Phuket. 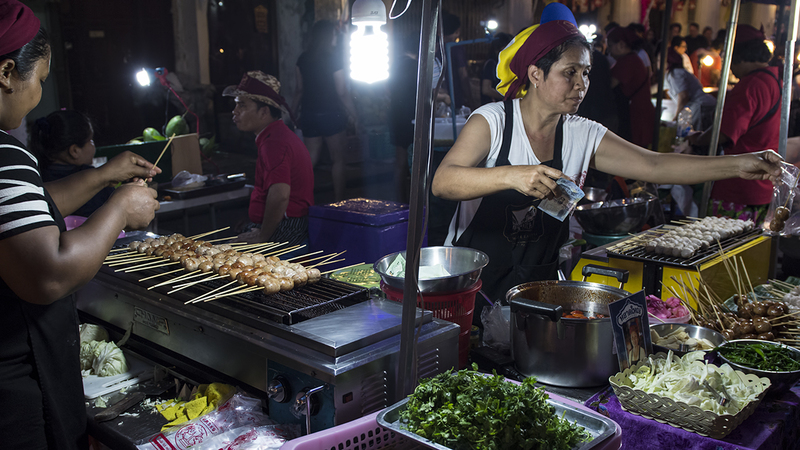 The island of Phuket has a lot of different markets, so many that you can find one just about every night of the week. 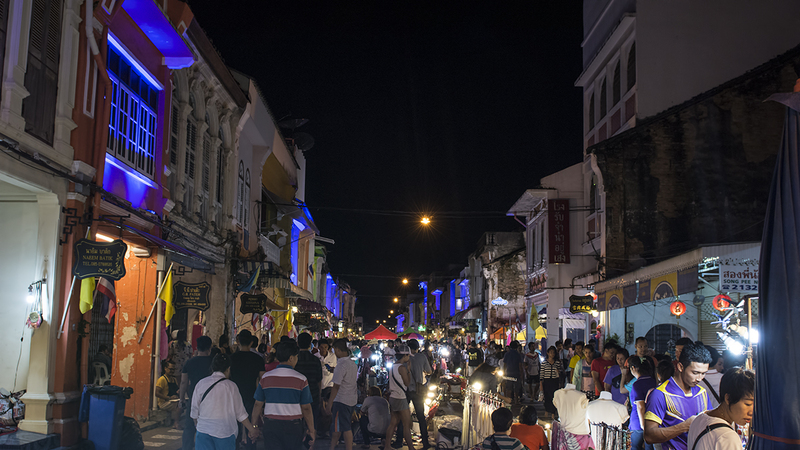 Phuket Town has the Indy market that is open from 4 to 10:00 pm Wednesday through Sunday, for the hip, young crowd. They have a LOT of delicious food there so don’t eat before you go! Actually ALL of the markets have excellent food, so always go to them with an appetite, haha. Check my link above for days, times, and a map to the locations. The Sunday Market, aka Walking Street Market, which is the photo to the left, is open as the title of the market suggests, every Sunday. You can find it in old town with all of the beautiful old Sino-Portuguese architecture lit up with purple, blue, and green lighting highlighting the buildings. Same, same, great food, nice souvenirs for taking home to family and friends, and just a fun place to be! Another great market is the Chillva Market, BUT in my opinion, the market that reigns supreme for me on Phuket Island is the Weekend Market, or as the locals call it, Naka Market. It is SOOOO big, it will keep you busy for hours! They have so much amazing food to eat, you could try a different vendor every weekend of the year and probably still have not gotten to them all. You can also get great deals on clothing here (don’t forget to bargain), and there are so many beautiful handcrafted things, from jewelry to artwork, to take home when you wrap up your trip if you ever decide to go back home that is! Just bring two suitcases, or a very big backpack for everything. Look for my videos I will be posting soon on my You Tube channel from my time at Phuket’s Weekend Market. You can find a link to my channel at the top of every page, and please subscribe to stay up with all the additional videos I will be posting on You Tube from my four months of travels through Asia. The Phuket Sunday Night Market, or Walking Market, with it’s beautiful Sino-Portuguese architecture lit up for the market.